Littlefoot, Me, and Tinkerbelle, both Sulcata Tortoises. A few days prior to the show, Boise State University asked me to do an Instagram Takeover on their account. For those of you wondering what in the world that is (hi mom), for 24 hours I took over their Instagram social media feeds, posting photos and InstaStories for their large following. Being a proud graduate of a BS in Biology, I was more than happy to give a behind-the-scenes look at my life working with animals. The response I received after my takeover was more than I expected! Special thanks to all of you who followed me after my takeover. Visit www.instagram.com/corbinmaxey for more! 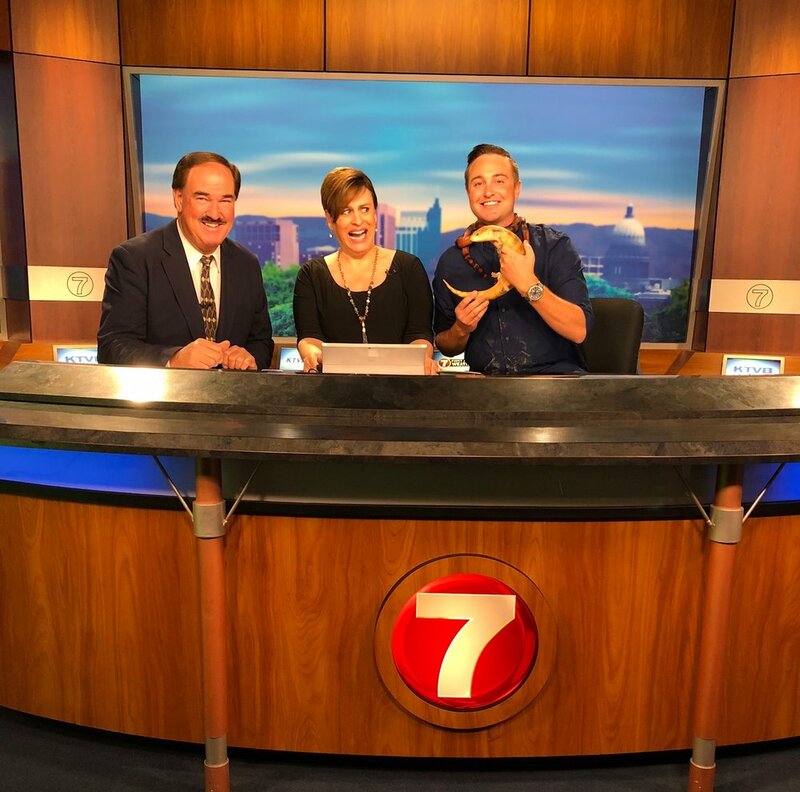 On the set of Boise's NBC Affiliate KTVB with Larry Gebert and Maggie O'Mara along with Topaz the Blue Tongued Skink and Hydro the Honduran Milk Snake. I absolutely love visiting my hometown station KTVB. This is the place where I got my start on television 15 years ago. It's also always a pleasure scaring the living daylights out of Maggie! I think reptiles are growing on her. Thoughts??? I've been appearing on The Today Show now for seven years, and I honestly get just as excited for every appearance as if it's the first time. What a lot of people do not see is the behind-the-scenes preparation for these national segments. Weeks (sometimes months) go into planning a 3-5 minute spot on national television. Here I am on the plane going over animal fact sheets. I like to research absolutely everything I can about every animal I bring on the show. I look specifically for interesting and unusual facts to share with audiences. 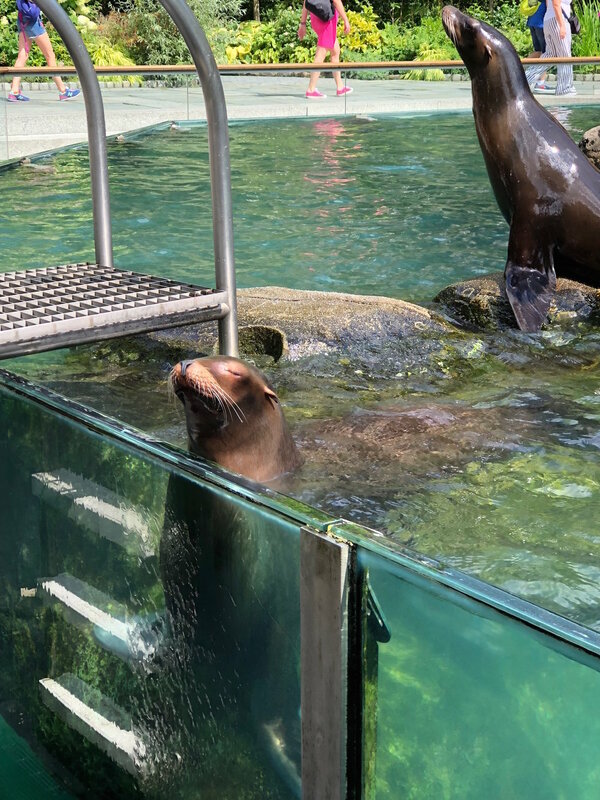 Two female California Sea Lions at the Central Park Zoo. I arrived in New York early afternoon and had a few hours to spare. Where did I go? The Central Park Zoo of course! I haven't been for quite some time and was excited to check it out. My favorite exhibit were the sea lions that are located right in the middle of the zoo. I arrived just in time for their afternoon feeding! I think everyone at some point in their life should visit New York City. There is just something about this place I cannot put into words. The energy, the massive amounts of people, sights, the sounds, I could go on! Can you believe Times Square draws over 50 million tourists a year? Keith Urban performing live on the plaza. Rockefeller Center Plaza was PACKED the morning of the show with anxious Keith Urban fans trying to get a glimpse of the country star. Keith sounded excellent live and because I arrived early before the animals, I had plenty of time to enjoy the show. "Mork", a 10-month-old American Alligator from the Pittsburgh Zoo and PPG Aquarium. I sure wish my alligators were still this small! Once the animal handlers get settled, I meet each animal one-by-one and go over any last minute details like on-air animal transitions. Can you believe that one day Mork will be over 13 ft long and weigh several hundred pounds?! "Fern", a 1-year-old Virginia Opossum from the Pittsburgh Zoo and PPG Aquarium. If you're a fan of my podcast "Animals To The MAX", or follow me on my social channels, then you'll know that I love opossums! Fern was actually rescued after her mother was hit on the road. A sad occurrence that happens all too often. Opossums are excellent to have around as they eat grubs, carrion, rodents, and ticks. "Gus" the Tamandua from The Turtle Back Zoo in West Orange, NJ. Photo Courtesy of Nathan Congleton, Today Show Photographer. The segment's theme was Animal Adaptations and what better animal to exhibit than the unusual Tamandua or Lesser Anteater! Their long snout and specialized tongue equipped with barbs, is a perfect adaptation to eat ants and termites. On the set of "The Today Show" with Kathie Lee, Hoda, and A-Rod. Photo Courtesy Nathan Congleton, Today Show Photographer. Right as we were set to go on-air, Gus decided that he'd rather explore than sit on his tree branch! That's the thing about working with animals; you never know what's going to happen! Here I am trying to get Gus back on the branch with no avail. Kathie Lee feeding Gus the Tamandua. Photo Courtesy Nathan Congleton, Today Show Photographer. How were we able to get Gus comfortable on the tree branch? His favorite snack of insect mush of course! Kathie Lee has always been very comfortable around animals and had no problem feeding the messy eater. A- Rod later took over and successfully fed his first Lesser Anteater! Opossums have an excellent sense of smell but poor eyesight. Photo Courtesy Nathan Congleton, Today Show Photographer. I love being able to use these national platforms to try and clear up some common misconceptions about particular animals. I'm so happy Hoda made a comment that the opossum looks like a rat when in fact they aren't even closely related! I also loved being able to share my favorite fact: That one opossum can eat up to 5,000 ticks in a single season! Bert and Big Momma, two Naked Mole Rats from the Pittsburgh Zoo and PPG Aquarium. Photo Courtesy Nathan Congleton, Today Show Photographer. Recently named one of the ugliest animals on the planet, Naked Mole Rats happen to be one of my favorite animals I've ever brought on the show. I had more fun researching and learning about them than any other animal. For instance, they cannot get cancer! They live longer than any other rodent at 33 years, and can survive 18 minutes without oxygen! Kathie Lee makes an excellent Animal Assistant! Photo Courtesy Nathan Congleton, Today Show Photographer. Photo Courtesy Nathan Congleton, Today Show Photographer. I absolutely love working with baby alligators. Only if every animal was this easy to present! American Alligators are considered one of the greatest conservation success stories of all time. In the 1960's they were nearly whipped to extinction. Thanks to laws and commercial alligator farms that took the demand away from killing wild animals, their population completely rebounded! There are now millions of alligators in the southeast United States. Success! Another Today Appearance for the books! Me and A-Rod after the show in Studio 1-A. Photo Courtesy Nathan Congleton, Today Show Photographer. A-Rod was super nice to hang around for a few photos after the segment. I tried to get him to hold Mork, but he wasn't going for it! Jennifer Lopez and her mom watching the segment live in Studio 1-A. J-LO and the crew behind-the-scenes during the filming of the segment. Who would have ever known that J-Lo would be subjected to one of my animal segments?! I asked if she wanted to see the alligator and she politely smiled and shook her head. Me and Guadalupe Rodríguez, Jennifer Lopez's mother. Photo courtesy Nathan Congleton, Today Show photographer. J-LO's mom on the other hand was more than happy to meet Mork and pose for a photo. Me and Nathan Congleton, Today Show Photographer. I have to give a special shoutout to my buddy and fellow Idahoan Nathan Congleton! 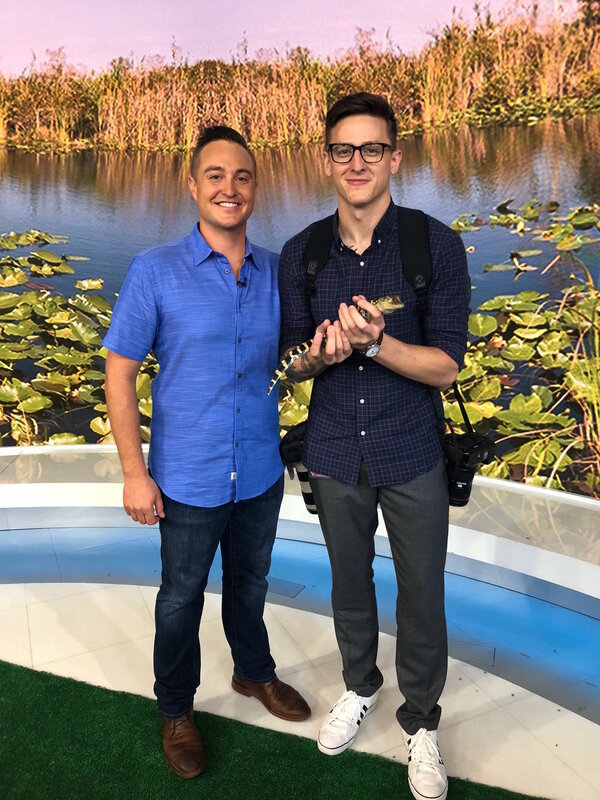 Nate is the staff photographer for The Today Show and always takes the time to send me photos after my segments. Thanks buddy! In case you missed the segment! Check it out and let me know what you think.